Overview: Two brothers from a Kansas farm enlist in the Army at the onset of World War II, and are assigned to the same unit serving in the Philippines. Trapped in a foxhole, one brother jumps on a live grenade to protect his sibling. While the grenade killed the first brother, the second brother is horribly disfigured. Given the option of a medical discharge, the disfigured soldier turns it down, wishing to remain on duty. His late brother had made a comment that one man in the right place can affect the outcome of a battle or a war. He takes on the designation of The Unknown Soldier, and returns to the front lines, undertaking special missions. These stories are generally one-and-done stories, which alternate between the European and Pacific fronts. The stories follow a predictable formula, all the way down to the page layouts to start each story. Towards the end of this volume, we get two multi-issue stories. Otherwise, these stories could be read in any order. Why should these stories be Showcased? : This is an interesting volume. From a historical perspective, these stories should be showcased. Anything that Joe Kubert worked on should be reprinted, and his art shines brighter in the black & white format. My concern is that I don’t think this is Kubert’s best work in the medium. I think you need to read his Sgt. Rock stories to really experience a Kubert war comic. Footnotes: Star Spangled War Stories #157 reprints a Sgt. Rock story where Easy Company encounters an unknown soldier but not “The Unknown Soldier”. That original story, from Our Army At War #168, was reprinted in Showcase Presents Sgt. Rock Vol. 3. If you like this volume, try: Joe Kubert’s book, Fax from Sarajevo: A Story of Survival. Based on communication from European comics agent Ervin Rustemagić, Kubert put together a disturbingly real look at what modern warfare looks like, detailing the Serbian takeover of the agent’s homeland. Rustemagić and his family survive for nearly two years before finally escaping Sarajevo for good in 1993. During this time, Rustemagić would communicate with the outside world via a fax machine, giving updates of the situation. One of the recipients of the faxes was Kubert, who later worked with Rustemagić to turn this into a graphic novel. Released in 1996 by Dark Horse Comics, Fax from Sarajevo received multiple awards both within the comics industry as well as within the publishing industry. 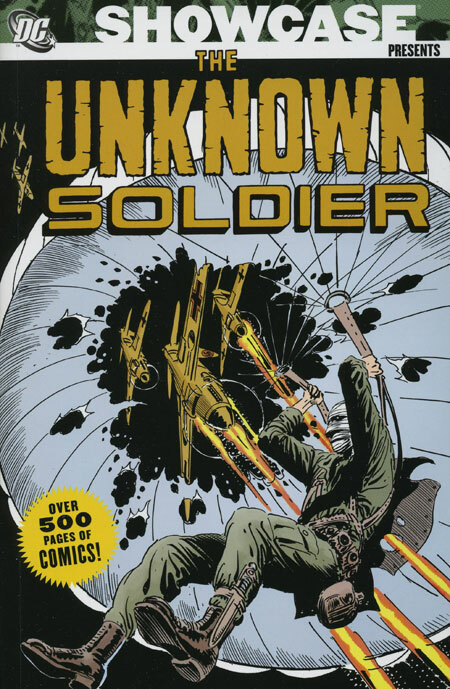 This entry was posted in DC Showcase Presents, Unknown Soldier and tagged Archie Goodwin, Bob Haney, David Michelinie, Frank Robbins, Gerry Talaoc, Jack Sparling, Joe Kubert, Robert Kanigher, Unknown Soldier. Bookmark the permalink.